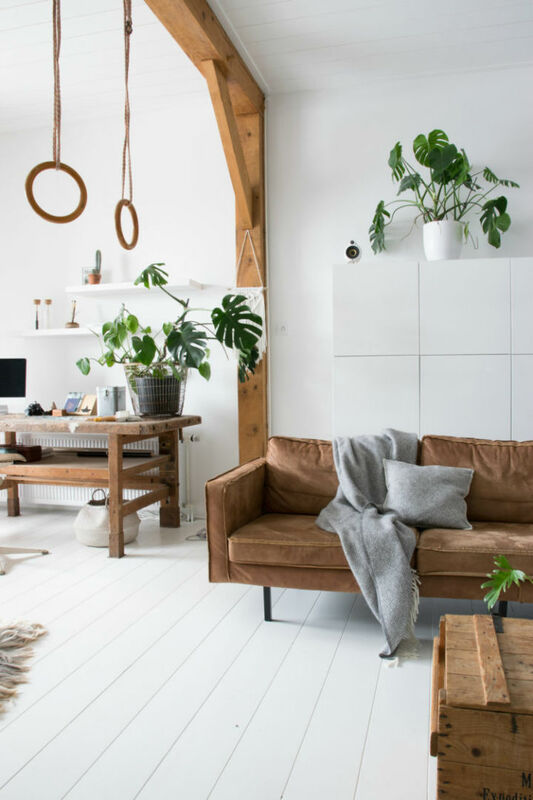 Whether it’s your idea of modern minimalism, a revolt against intense interior hues, or uber-chic innovation, there’s no secret that all-white floors and ceilings have become more popular than ever. The love of the all-white interior look is versatile, which is probably why interior designers adore it. For instance, in this beautifully designed home white floors and ceilings are prominent. 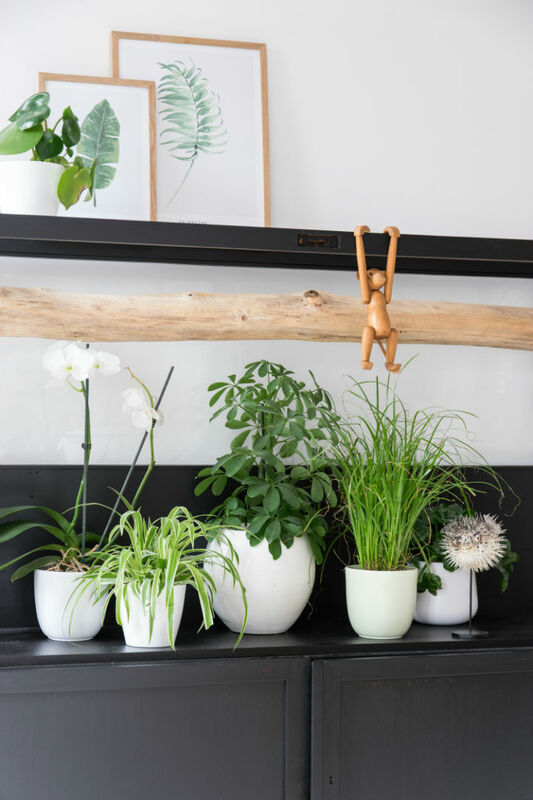 The aesthetic appeal is complemented by green plants, natural accents, and furnishings constructed from raw materials. 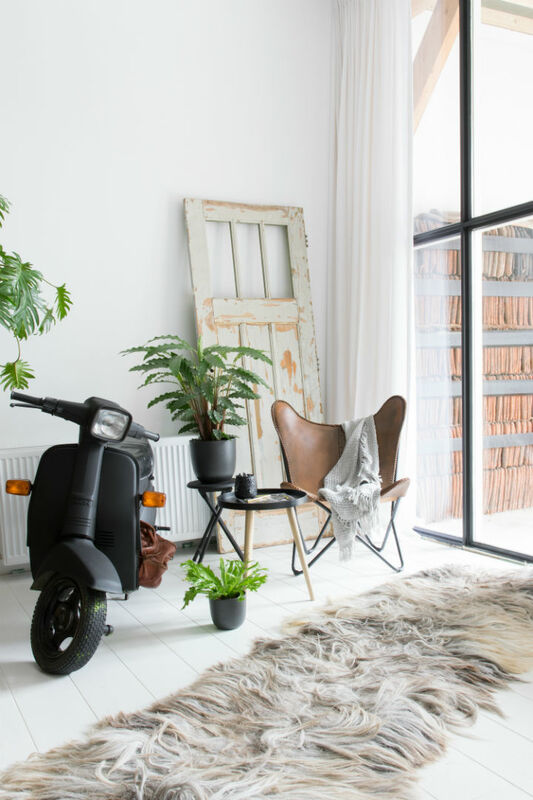 There’s nothing pretentious about the interior design of this home. It’s pleasant, light, and engaging. 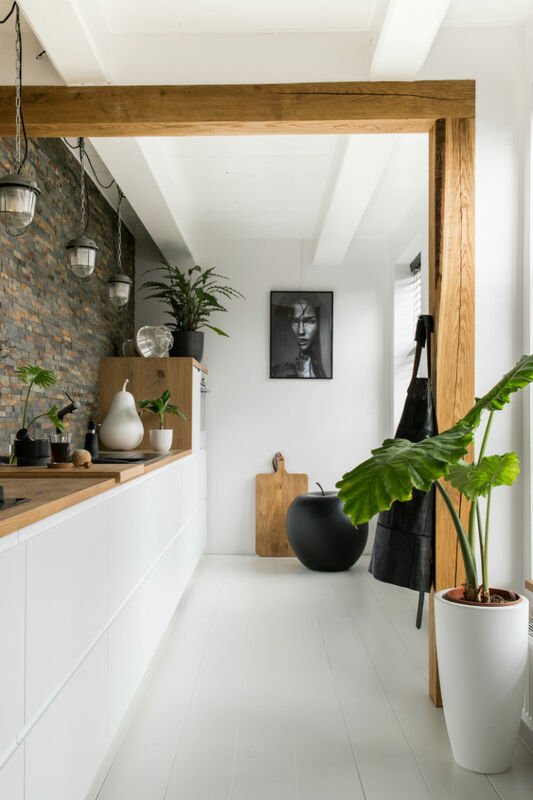 If you have a love affair with white interiors, this home will make you smile. This interior’s restful and soothing ambiance flows throughout the space. The same with any other hue, white ceilings and floors need contrast whether it’s another shade, texture, or pattern. This home provides all three, while the distinguished color theme unifies the space around individualistic furnishings and accents creating a tranquil setting. 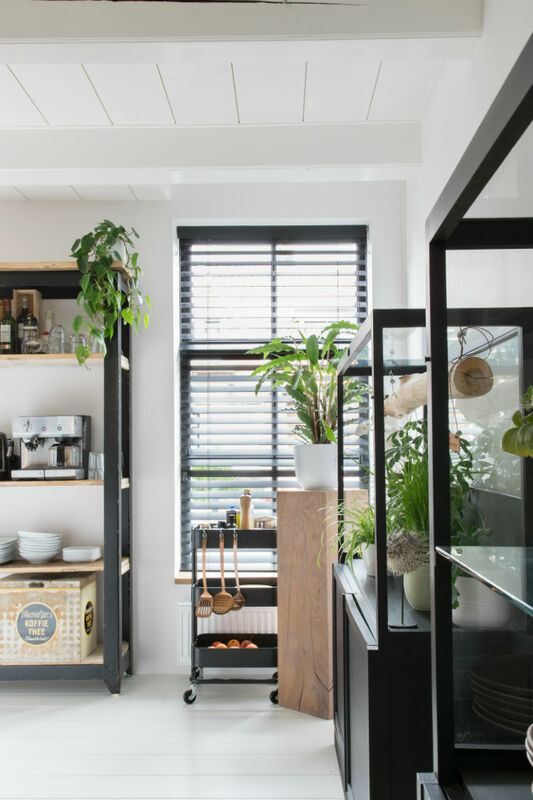 The kitchen space is enhanced by natural materials like cappuccino colored wood, that bounces off black accents and appliances. The effect is stunning, yet modest. Euro style cabinetry highlights the sophistication and overall contemporary style of the area. The mosaic stone backsplash adds an additional texture and depth producing a rich and down-to-earth ambiance. Another interesting effect are the matted black accents. They blend flawlessly with the glossy black stove-top. 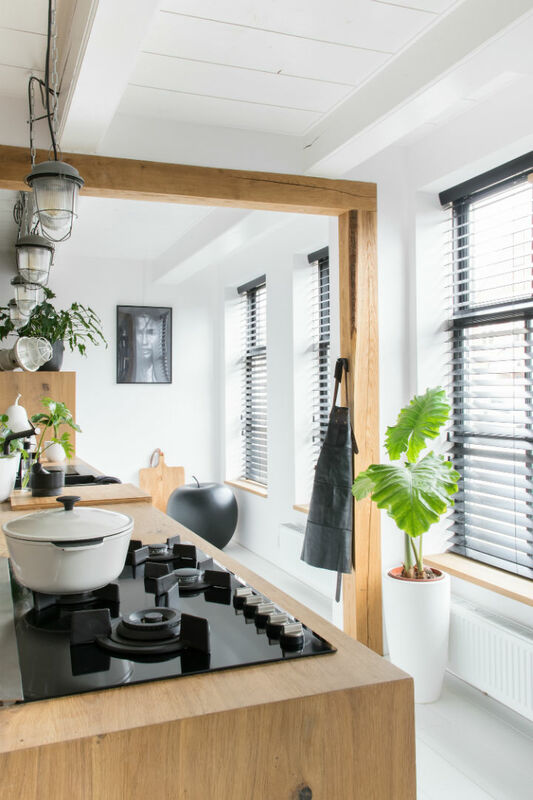 Window blinds enhance the modern yet minimalistic effect. 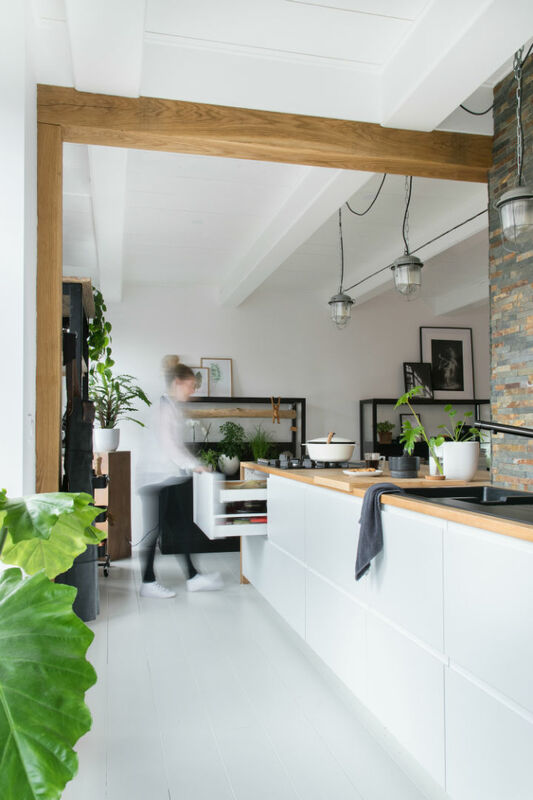 The dining are off from the kitchen creates an open-space flow. 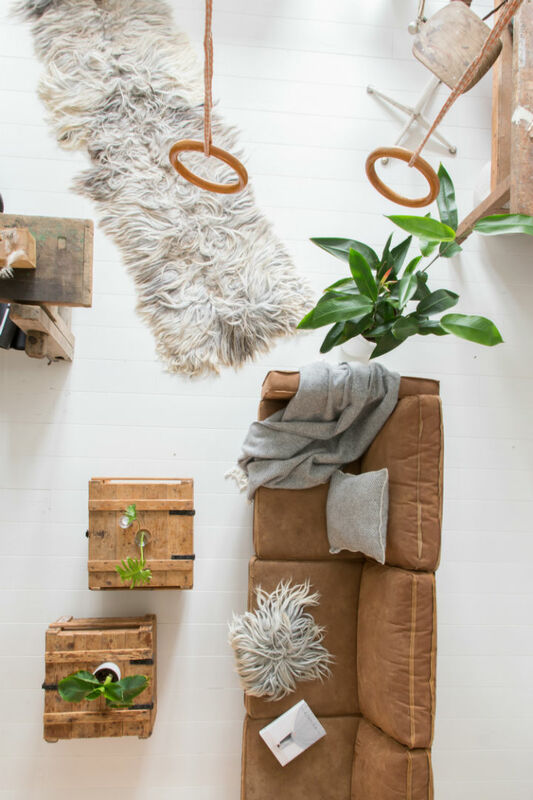 Once again, natural elements such as leather, wood, and greenery continues the decor’s earthy theme. The natural lighting is amazing and during the night-time hours, suspended lights and wall lighting impressively illuminate the room. 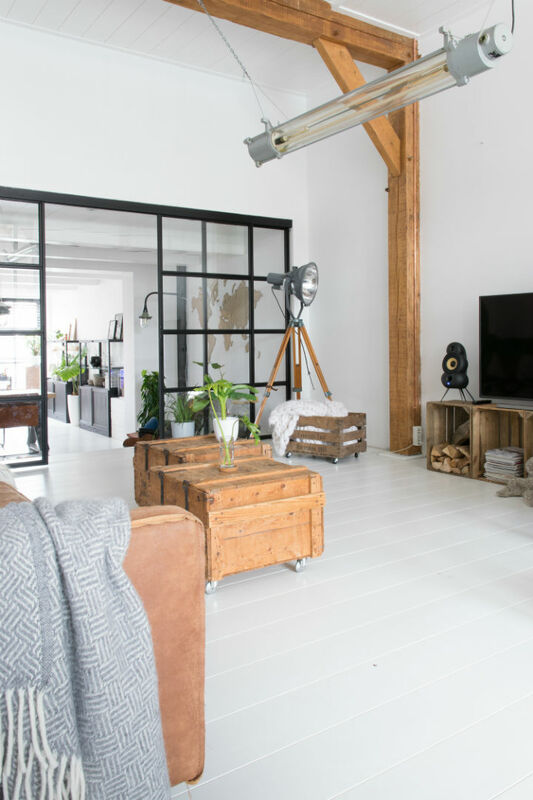 French paned doors divide the space without disrupting the apartment layout. Wall art is sparse, yet each piece is eye-catching. 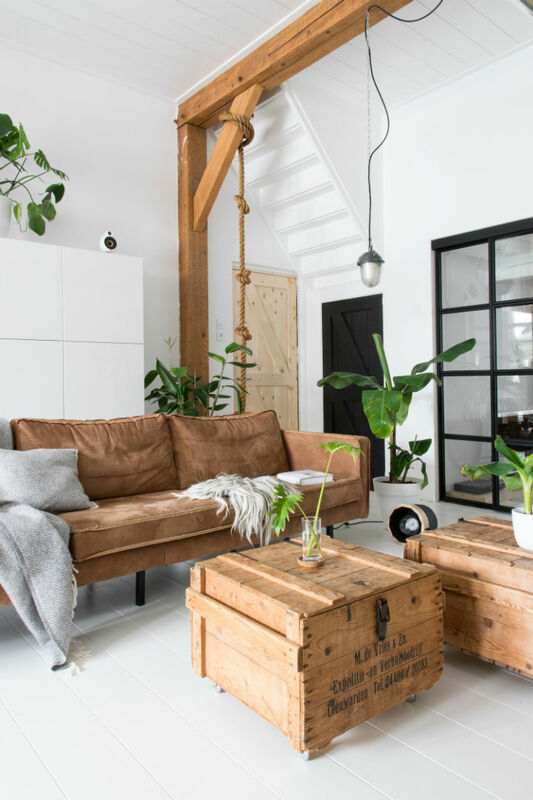 A leather sofa, coffee tables constructed from wooden crates, and wooden artist table are attractively harmonious. Notice the upside down staircase on the ceiling. It’s an exceptional work of art! Most people envision a bedroom with a plush décor. The bedroom in this home is quite the opposite. 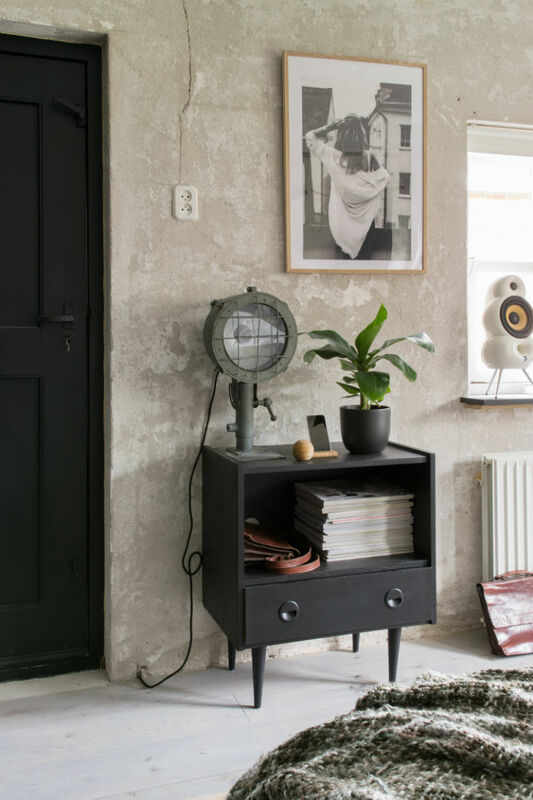 It has an industrial décor that’s cool and sophisticated. 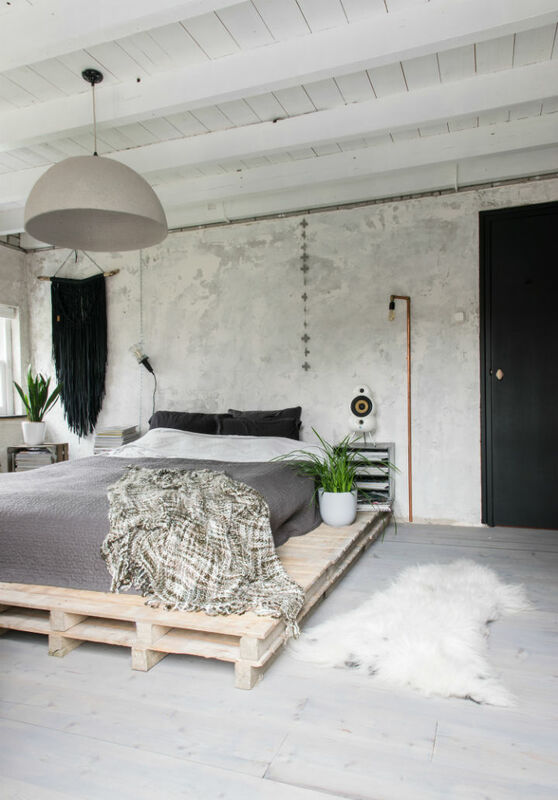 The base of the bed is made from wood pallets known as Lego for adults. It’s a fantastic idea, especially if you are on a tight budget. Purposely unfinished concrete walls actually look finished. It’s an extraordinary concept for a bedroom, but it works! 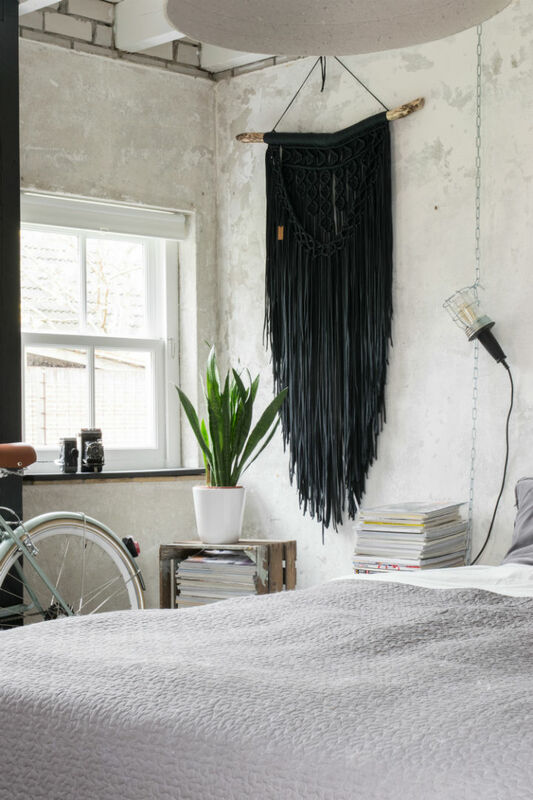 The black leather fringed wall art has the look of a dreamcatcher originating from Native American culture. It’s a magnificent piece. In fact, it’s a magnificent home designed with love and originality.